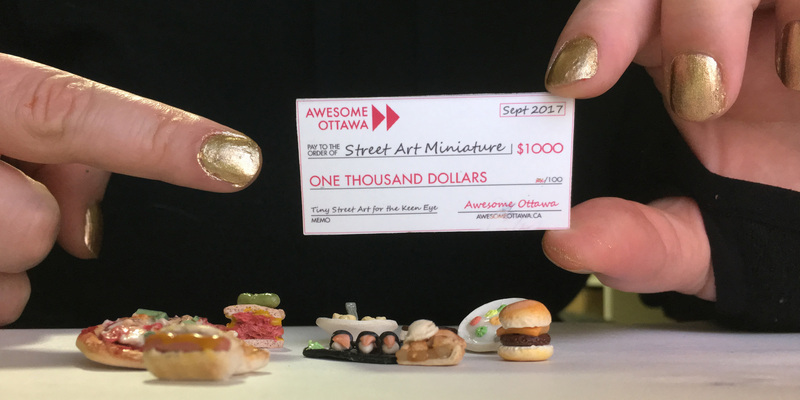 September’s Awesome Ottawa award goes to an anonymous recipient who has been hiding hundreds of realistic food miniatures in plain sight around Ottawa. “I am working hard,” she explains, “to make the streets of Ottawa a little more fun. I create clay miniatures of various popular foods and place them in the cracks of the city for people to find or stumble upon.” So far she has hidden more than 400 such miniatures around the city, posting pictures of many of them on Instagram and Facebook. In an interview with Artsfile earlier this year, our winner explained: “My story and experience aren’t relevant to the joy of finding a piece of miniature food hidden in the cracks of the city. I love the simplicity of it, and the mystery of who I am protects that simplicity.” She has also been reported on by CBC Ottawa and the Kitchissippi Times.